NEW YORK (AP) — Minutes into the playoff debut for these young New York Yankees, they trailed Minnesota by three runs. Their starting pitcher lasted just one out. A sellout crowd was stunned. Could their postseason be over almost before it began? Nope. A strange AL wild-card game was only just beginning. Judge, Didi Gregorius and a brilliant bullpen rescued New York and lifted the Yankees to their first postseason victory in five years. Gregorius’ three-run homer tied the score in the first inning after Minnesota knocked out Luis Severino, a pumped-up Judge showed his most emotion this season when he hit a two-run shot in his playoff debut and the Yankees beat the Twins 8-4 Tuesday night. New York plays the Indians in a best-of-five Division Series starting Thursday. Brett Gardner also homered for the Yankees, who chased Ervin Santana after two innings and once again eliminated Minnesota from the playoffs. Chad Green, David Robertson, Tommy Kahnle and Aroldis Chapman combined for 8 2/3 innings of one-run, five-hit relief, striking out 13 to tie the postseason record for a bullpen. “It was just remarkable,” Yankees manager Joe Girardi said. Twins manager Paul Molitor marveled at the Yankees relievers and Girardi’s use of them over 142 pitches. Brian Dozier led off the game with a home run and Eddie Rosario hit a two-run drive as the Twins burst to a quick lead. But Santana went to full counts on eight of 11 batters, and he was removed after six outs and 64 pitches with the Twins trailing 4-3. Minnesota, the first team to follow a 100-loss season with a playoff appearance, lost its 13th consecutive postseason game, tying the record set by Boston from 1986-95. The Twins have been eliminated by the Yankees in five of their last six postseason appearances and have not won a playoff series since 2002. New York won nine regular-season games after trailing by three runs, according to the Elias Sports Bureau — including when Severino fell behind against the Twins on Sept. 20 as New York rebounded to complete a series sweep. Gregorius erased the deficit in this one four batters into the bottom of the first. “I was hyped, and I tried to get the game going, tried to get the guys going,” he said. 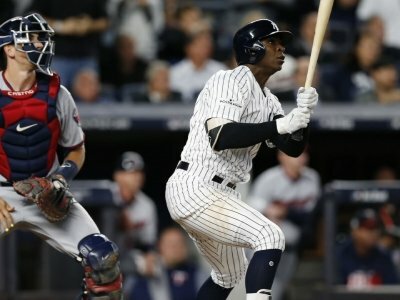 Judge, the 6-foot-7 sensation who set a rookie record with 52 home runs, was given a Ruthian ovation, with several sections of fans holding signs in his honor spelling out “All Rise!” He scored three runs, hitting a single to help ignite the first-inning rally, smoking a 108 mph home run off loser Jose Berrios in the fourth and walking in the seventh before coming home when Alan Busenitz walked Aaron Hicks with the bases loaded. Judge shouted in excitement as he rounded first base after the homer, his face flush with emotion. “This place was rocking. It was incredible,” he said. New York had made only one postseason appearance since 2012, losing the 2015 wild-card game to Houston 3-0. Just three Yankees who started that game were in the starting lineup, part of a Baby Bombers movement that purged the roster of veterans. At 23, Severino was the youngest Yankees postseason starter since Andy Pettitte in 1995. The right-hander lasted only 29 pitches on a crisp autumn night and matched the Yankees’ shortest postseason start, by Bob Turley in Game 2 of the 1958 World Series and Art Ditmar in the 1960 World Series opener. Severino was shaking his head as walked to the dugout and Green replaced him with runners at second and third. Green struck out Buxton and Jason Castro , then fanned three in a row in the second. “I think we’re all ready to be in from the first to the ninth,” Green said. Robertson came in with the bases loaded in the third and allowed Buxton’s RBI grounder , then struck out Castro. Robertson tired in the sixth but earned the win, leaving after 52 pitches and 3 1/3 innings. His only longer professional outing was 3 2/3 innings for Double-A Trenton in April 2008. Kahnle relieved with a runner on and retired Joe Mauer on a flyout to the warning track . After Kahnle threw 2 1/3 perfect innings , Chapman struck out three around a hit in the ninth. A pitcher named Santana — Johan Santana — beat the Yankees for the Twins’ last postseason win in 2004. But Ervin Santana’s career postseason ERA climbed to 6.57, contributing to a first inning that lasted 45 minutes and three innings that took 1:43. Gardner walked leading off, Judge poked a single to center and Gregorius lined a fastball over the right-field scoreboard. Brushed off the plate by a 2-2 pitch in the second, Gardner sent Santana’s next offering into the second deck in right for a 4-3 lead. Green struck out the side in the second, but left in the third after a leadoff single and two walks loaded the bases. Buxton hit into a run-scoring forceout before Robertson struck out Castro, and the Yankees went ahead for good in the bottom half when Gary Sanchez doubled off Berrios leading off and scored on Greg Bird’s two-out single. After a moment of silence for victims of the Las Vegas shooting , Broadway star Aaron Tveit asked fans to join him in singing “The Star-Spangled Banner.” Players on both teams remained at attention on the field until the color guard reached the foul line. Yankees reliever Chasen Shreve, a Las Vegas native, threw out the ceremonial first pitch. When the Yankees last won a postseason game, Judge was at Fresno State. Bird had just finished a season with the Class A Staten Island Yankees, Sanchez with the Class A Tampa Yankees and Severino with the Dominican Summer League Yankees. RHP Masahiro Tanaka (13-12) is likely to start Thursday for the Yankees against the Indians and Trevor Bauer (17-9).